july | eat. drink. cook. travel. 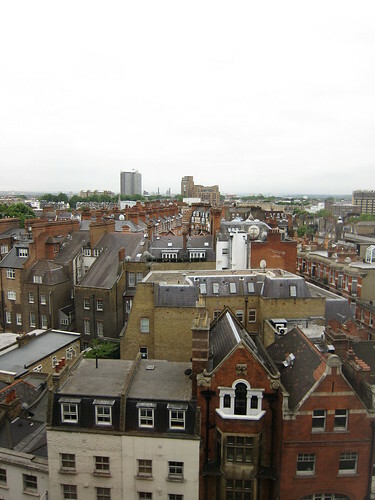 The last leg of our trip was in London. It was a pity that I only had slightly more than 24 hours in one of my favourite cities. 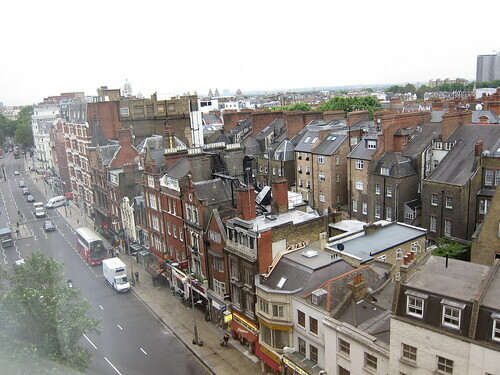 I didn’t do much in terms of leisure except take photos from my hotel window at High Street Kensington. It was a bit of a shock to come in from high, hot summer in Milan and Paris to a cool welcome in London. I had to put on my jacket to go out, it was that cool. London was the same grey it has always been. … and Naseem. They were kind enough to travel all the way to my neck of the woods just to have dinner. Lucy chose the very yummy Lebanese restaurant, Falamanki. They had fantastic drinks like this honey and avocado smoothie. 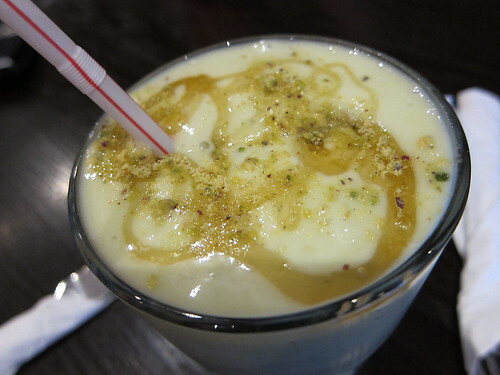 The lusciously blended avocado was topped with amazingly fragrant honey and an aromatic sprinkling of ground pistachios. Very good indeed. 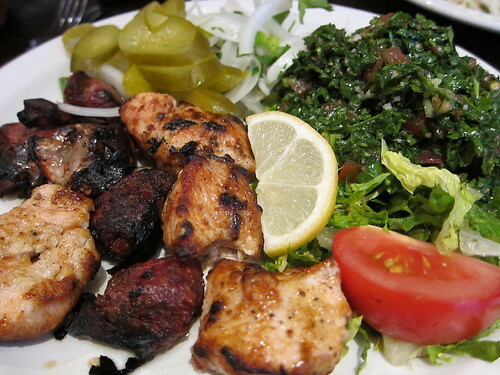 I went on to have the mixed grill, a selection of chicken and lamb marinated and grilled in various ways, accompanied by a tart tabbouleh to cut through the meat. It was good stuff, though not as good as the company I had for the evening. 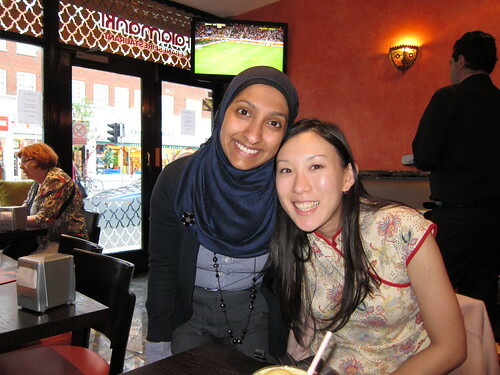 It was lovely to catch up again after so long! It was a long, tiring and sometimes gruelling trip, what a lovely way to end it off meeting with old friends. 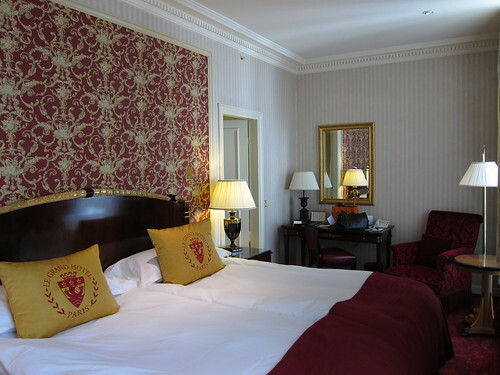 The next part of our trip brought us to Paris where we stayed at Le Grand Hotel, run by the InterContinental. 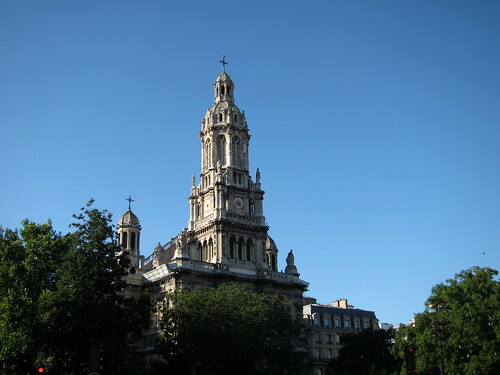 It was indeed a nice hotel with typically Parisian and very opulent rooms. There were soft beds (which my head of delegation didn’t like – oops) and plush carpets. There was also peeling wallpaper and the shower flooded the whole bathroom. 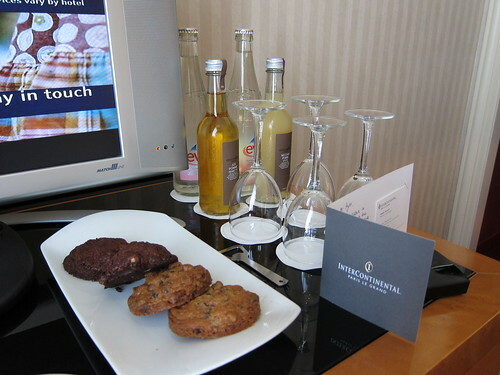 Something weird happened: as I was settling in, room service rang and set up this elaborate set of drinks and cookies in the room. It was well and good until I excitedly rang my boss and asked if he was enjoying the complimentary drinks. (He wasn’t.) Then I realised that the welcome card had the wrong name on it! Horrified, I called our local representative office who booked the rooms for us to check if that was the name of the secretary doing the booking. (It wasn’t.) So I took their advice to “just whack.” and did exactly that. If you didn’t mind the odd service, the InterCon Le Grand is a nice though horribly over-priced place to stay. Thankfully, we had a free upgrade so the rooms were expensive but not quite horribly expensive for the company. 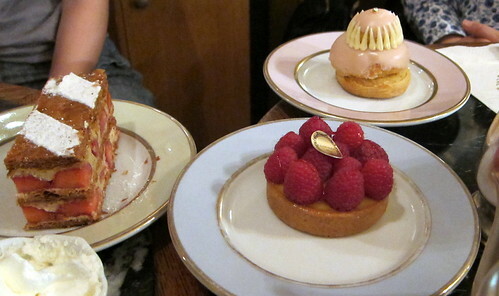 We had a while to wander about town and enjoy some cakes at Laduree, which was thankfully still open on a Sunday. It’s such an institution there and if you haven’t tried their macarons, you haven’t really tasted one before. Their desserts are all very yummy too. 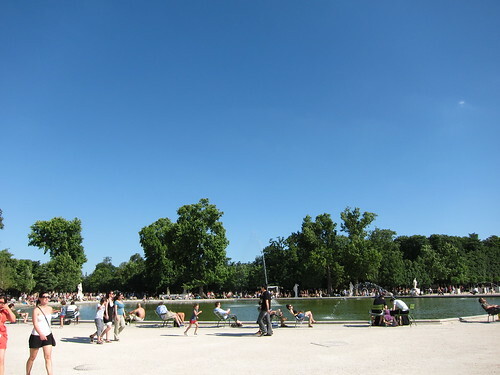 Thereafter, we went for a bit of a meander through town, passing by the Place de la Concorde and the gardens in the area. There were so many people out in the later afternoon after the shops were closed, simply enjoying the sun. 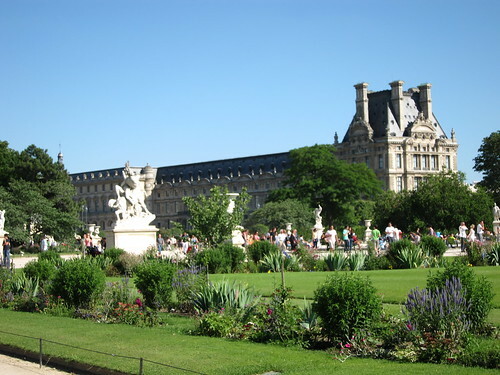 While it was inconvenient for us that we weren’t able to shop in the little time we had in Paris, I liked the idea of life going on in the daytime in spite of the dearth of shopping and commerce. 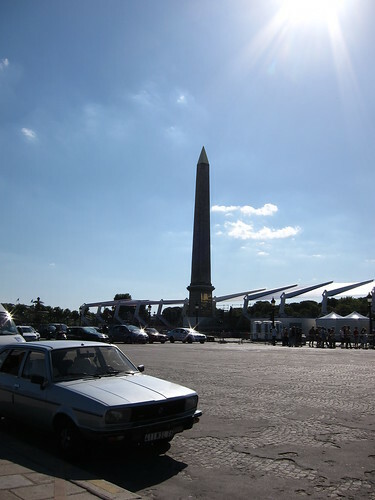 I took the requisite touristy photos at what I think is the Place de la Concorde and its obelisk. And I grabbed some other pictures of the beautiful buildings sitting pretty in the afternoon sun. 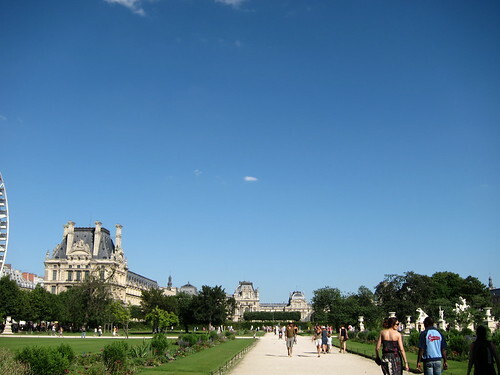 One of them could be Hotel Crillon, but I can’t be sure. The weather was too beautiful for it to matter. On the day with business meetings, it was a rush from stop to stop, with quick photos taken out of the rented car window. 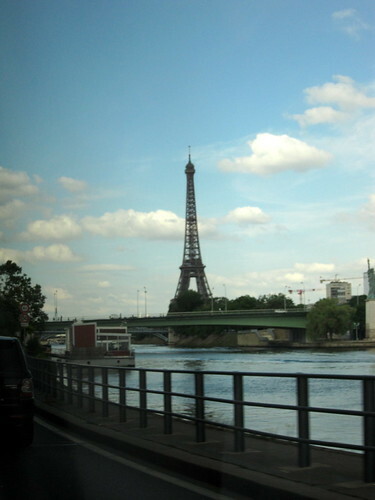 And this is the only decent shot I got of the Eiffel Tower, taken in the distance. When we finally got back from our business meetings, it was only to get a quick round of shopping before the shops closed. 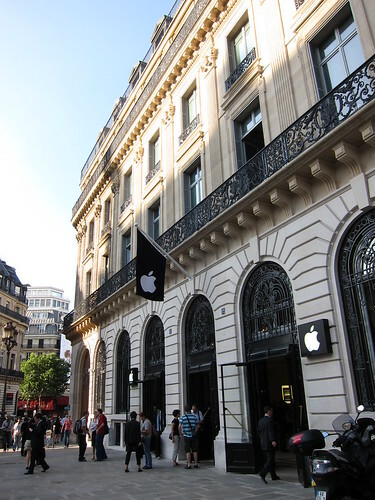 One of the incongruous ones I saw was this thoroughly modern Apple shop in an obviously old and well-preserved building. We finished off our Paris leg of the trip with a lovely meal at Oscar Restaurant, a favourite of our local representatives. 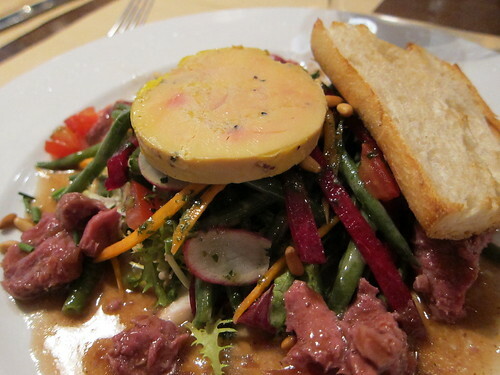 I started with a lovely giblet salad topped with a duck liver terrine. 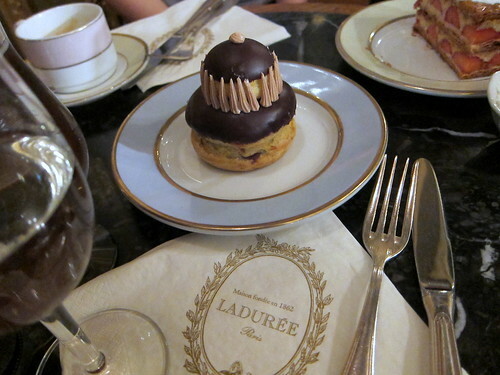 It was typically Parisienne and a much wiser decision than my earlier choices of stodgy food in Milan. I was feeling quite heaty from all the travelling and eating (and being stuck in a boardroom for a whole afternoon without getting even a sip of water – poor organisation on the part of the hosts). 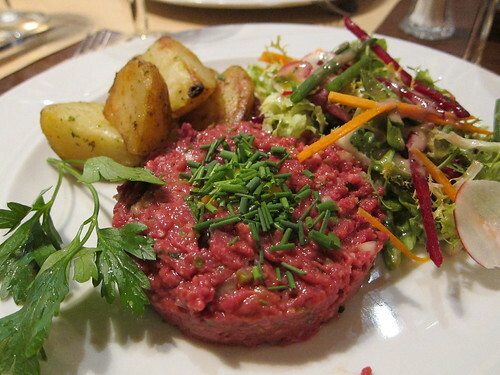 The beef tartare as a main was very welcome. It was the best one I’ve had, the fresh and tasty raw beef being seasoned just right and not being overwhelmed by the pickle and onion chopped into the mixture. The fresh herbs and side salad helped lots too. By now, my dining companions were looking askance at my rather different choices and wondering what I was going to have for dessert. 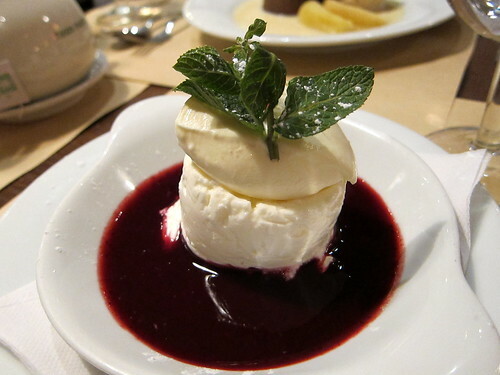 I eschewed the usual chocolate puddings and ice cream and gunned straight for the Faiselle, a type of sweet cheese topped with creme fraiche and accompanied with berry coulis. It was just the right creamy ending to my dinner. We were very fortunate to be treated to a good dinner, my first Michelin star experience at the one-star Tano Passami L’Olio. The name literally meant “Tano, pass me the olive oil.” Chef Gaetano is very big on olive oils and treats it almost like wine in how he pairs each carefully, selecting carefully which oil he uses to finish each dish. 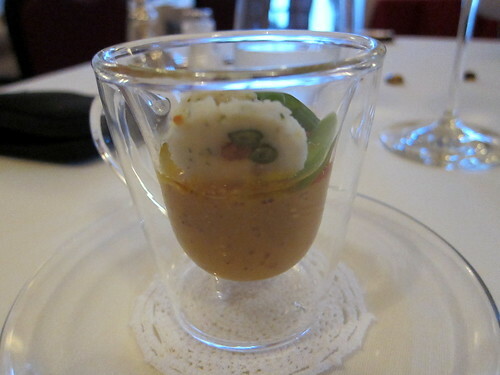 We went for a tasting menu of sorts, starting with this amuse bouche. Unfortunately, it wasn’t a Wow! moment, more of a “hmm this is rather good.” It was interesting how the mousse was finished of with olive oil but I don’t remember a great deal more than that. 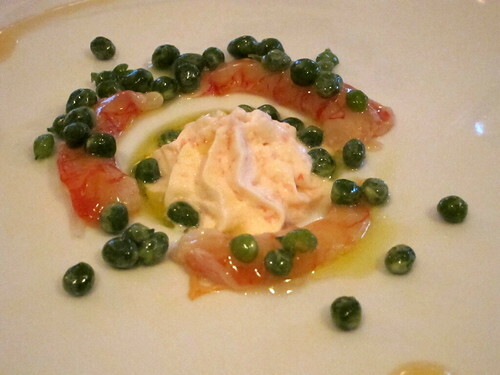 The next dish was quite interesting – raw prawns Milanese-style marinated in citrus and anise, accompanied by pink grapefruit and cheese mousse and graced with caramelised peas. I wasn’t sure about the peas as they were semi-dry, with texture reminding me a bit of wasabi peas, just not as crunchy. I liked the fresh, fresh! prawns that were singing with the zing of the sea (go figure that out, I’m taking things up a notch – it’s a Michelin-starred place yo) and the grapefruit and cheese mousse was nice, though it tasted a bit like it was meant for baby food, but what lovely fine dining baby food it was! Now it was the next dish that really brought things up a notch. The caramelised quail eggs on tuna mousse was a revelation. The first one after going in the mouth went crackle! pop! and there were surprised looks all round the table. Then understanding dawned and we gleefully went with the second one. First, the sensation of caramel on the tongue, as it was an egg-shaped creme brulee with crackly crust all round. Just a little pressure with the teeth and tongue and the delicately cooked quail egg burst, coating the tongue with runny yolk. The tuna mousse made for a savoury counterpoint to it all. And the raw tuna in minted olive oil? Gilding the lily with its freshness. Our expectations went a little higher with the pasta course and we were not disappointed. 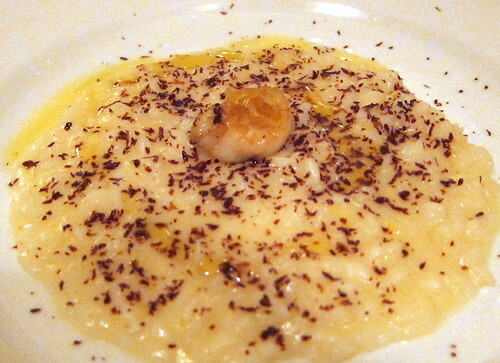 We were presented with lemon risotto cooked in vegetable and milk and finished off with chocolate. I was a bit wary of this as I wasn’t sure how dessert-like a lemon and chocolate rice dish would taste. But no, this was deeply savoury, rich and wonderfully al dente. At the same time, the lemon flavour sang through and the bitterness of the chocolate balanced out the flavours. It was another eye-opener. 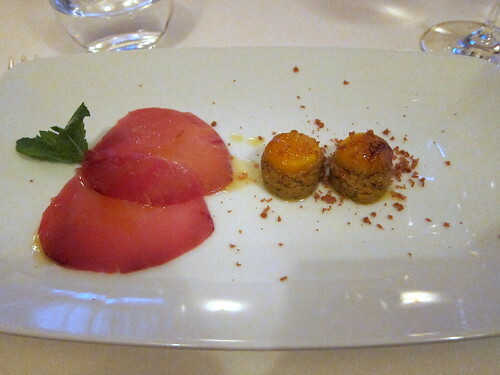 Next time I’m in Milan, I’m coming back just for this dish. We were surprised by how full we were getting at this stage, we really hadn’t eaten a great deal, but it shows how satisfying the food was. We were very glad that the main course came in small portions. Small though the portion was, it was somehow the perfect portion. 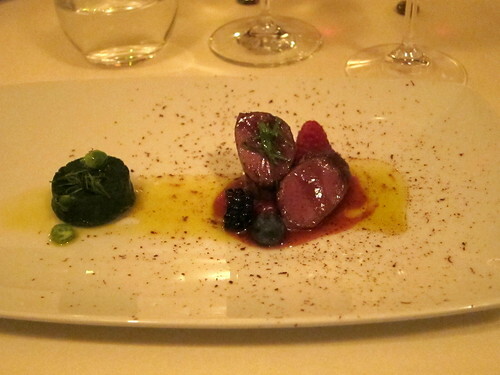 The roe dear saddle glazed with basil and wild berries and again finished off with chocolate was excellent. It was done very rare, the way I like it, yet wasn’t bloody (which the rest of my table seemed to like more). I think the meat must have been well hung because it was the tenderest deer I’ve had. 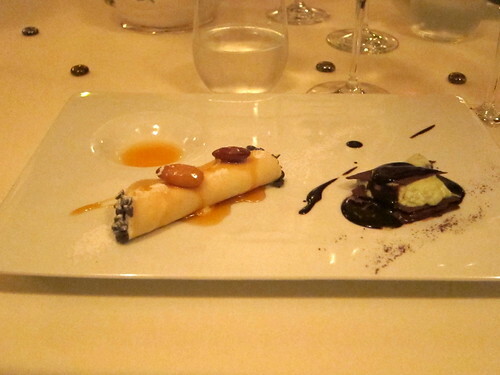 Again, Chef Gaetano had a way with traditionally sweet foods, turning them into savoury wonders. The chocolate he personally grated over each portion at the table made all the difference again in balancing out the sweetness of the sauce and tempered the deep game flavour of the venison. Wonderful. What really won the rest of the table over (I was head over heels by then, no need for further wooing) was Chef Gaetano’s impeccable and very sensible wine pairings. He recommended two reds, only one of which I managed to get a photo of. 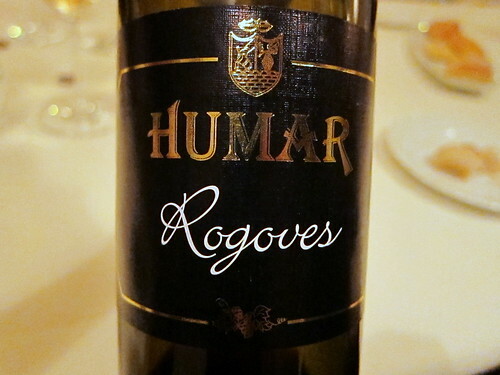 This Humar Rogoves from the Friuli region was very reasonably priced at about €30 and was just right for the deer. In the words of the chef, it was a “sweety wine, very nice.” And indeed it was! Nicely balanced, sweet yet not overly so, it went better than expected with our deer in berry sauce. 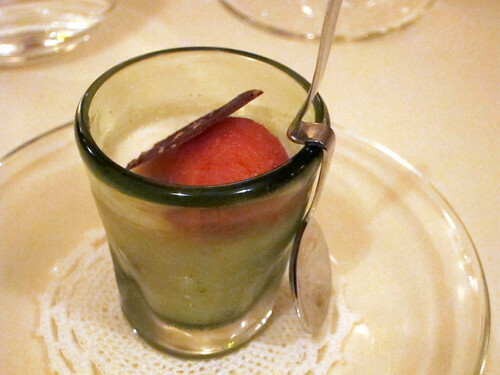 Then came the usual sorbet palate cleanser. And finally dessert. The almond cannoli filled with almond mousse, candy lemon, citrus cream and almond marmalade was lovely. The pastry was crisp and light as air and the mousse filling also light and sweetly lemony. It was a lovely contrast to the dark chocolate blob (I never found out what it really was), but the mousse and chocolate sauce was a deep, delicious contrast. It was a sly way of crowd pleasing, not particularly inventive but just the right to end a good dinner. 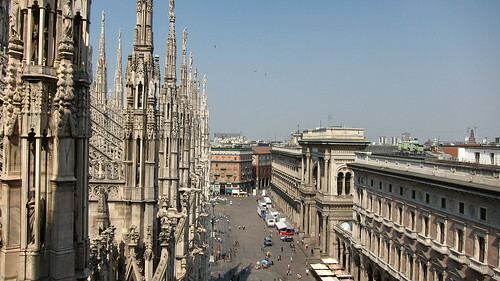 As it happened, we had a weekend off and spent a glorious summer Saturday enjoying Milan. 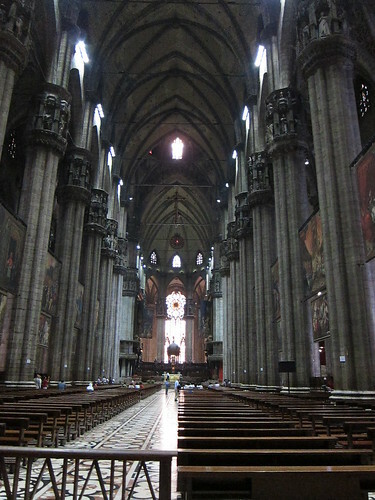 First was a revisit of the Duomo I last saw 10 years ago. Then, it was grey and swathed in scaffolding. Now, it’d been restored to a beautiful white and tan. 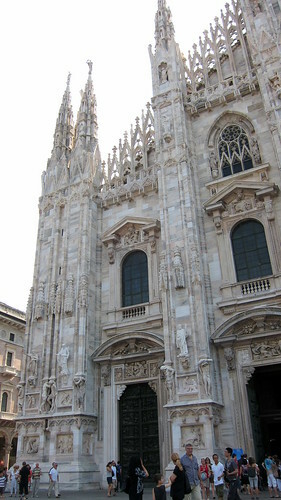 The hotel was just round the corner and I was too lazy stand far enough back to get a good shot of the Duomo in all its glory. You’ll just have to imagine what it looked like with the sun starting to shine hotly down its spires. 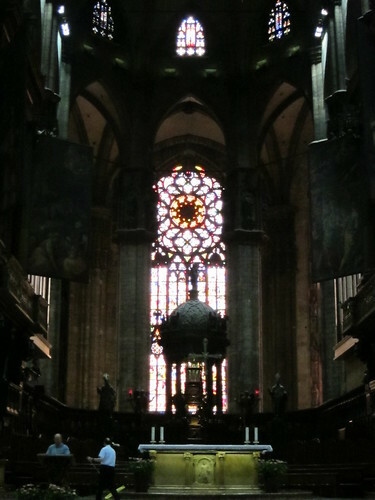 The inside, while pretty awe-inspiring in its sense of space, was pretty grey like the last time I saw it. 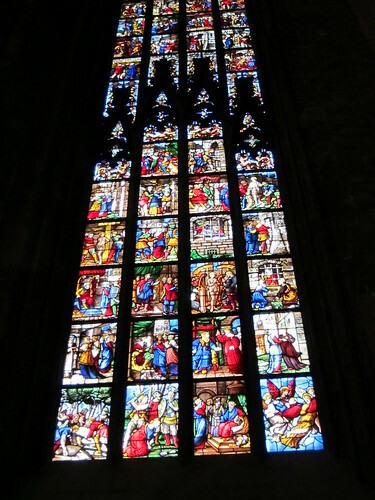 … and the beautiful stained glass. I stood for ages admiring the rich colours of the religious scenes. 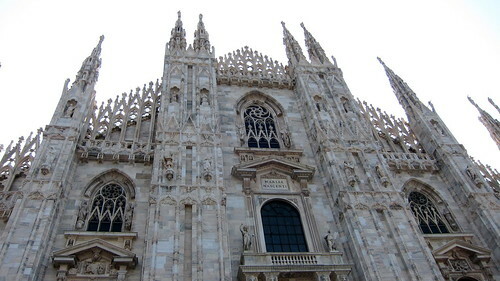 But the roof of the Duomo beckoned too. I paid a few euro to get some exercise climbing up the stairs. It was lovely to see the skyline with all the old buildings, not a skyscraper in sight. 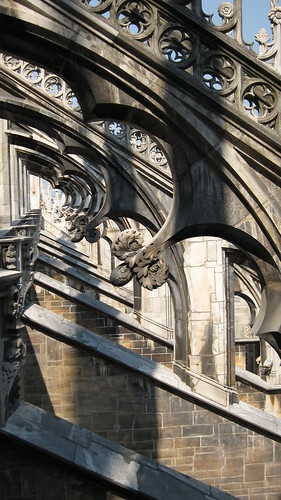 On the roof, there were delicate carvings on the flying buttresses repeating themselves over and over again. And more of them framed the brands of the shops down below. 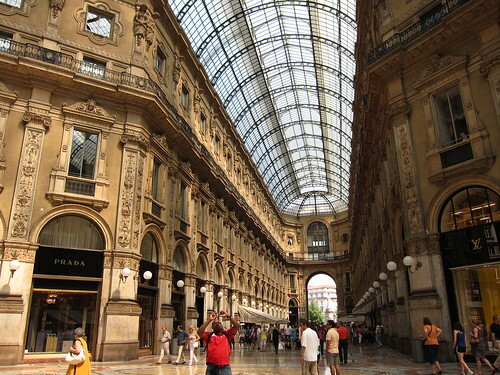 It was time to answer the call of commercial Milan and go shopping! And right next to the Duomo stood Galleria Vittorio Emanuele, apparently the world’s first shopping centre. It was beautiful inside, with a lovely glass ceiling and big shopfronts, rather unlike modern shopping malls. Then the photos stop because I started shopping. 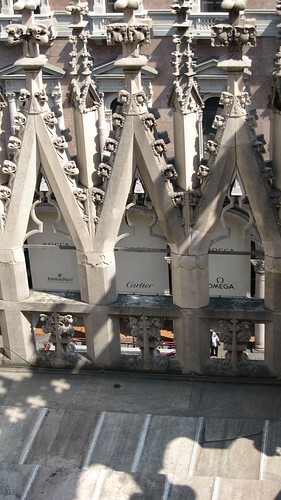 I walked the entire Quadrilatero, those few streets housing the biggest fashion brands in the world. It happened to be the first day of the sale and outside the major brands like Gucci, Prada and Miu Miu, long lines formed just to go in. I had to take a break after a while and ended up in Cafe Cova eating the most expensive wild strawberry tart I’ve ever had. To be fair, it was rather big, but paying something like €20 for a piece of confectionery made me blanch. At least it was really yummy before the bill came! 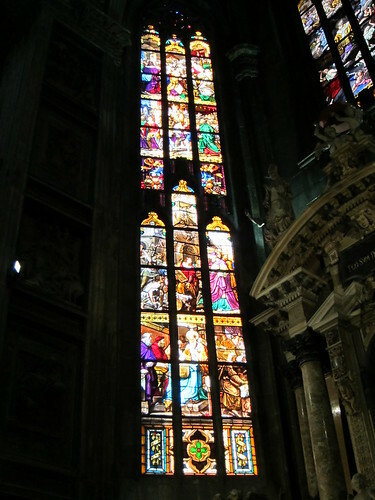 I went for a work trip in July last year and was lucky enough that it involved a whirlwind trip of the shopping capitals of Europe, with the first stop being Milan. We took the red-eye flight which meant that we got off the plane early enough to have breakfast at a bar just before our first meeting. We were thankful for the Italian custom of drinking espresso like water and helped ourselves to copious amounts of the brew to keep us awake in the business discussions. One of the companies we met was very hospitable and brought us to Trattoria Del Drago for a very welcome lunch. The trattoria was set in a little garden and there was a lovely relaxed vibe to it. 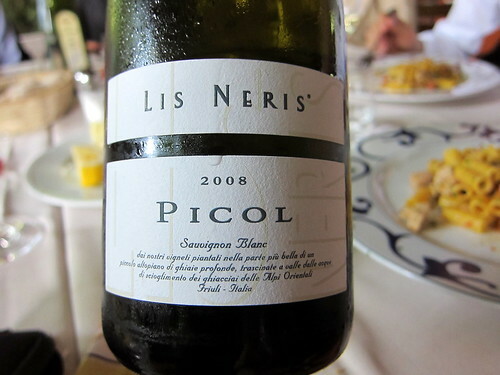 We had a lovely white wine to go with our lunch, the Picol 2008 (14%). It was a light and crisp sauvignon blanc with a lime flower nose and plenty of slate in the finish. It was a lovely accompaniment to our appetiser. And what an appetiser it was! 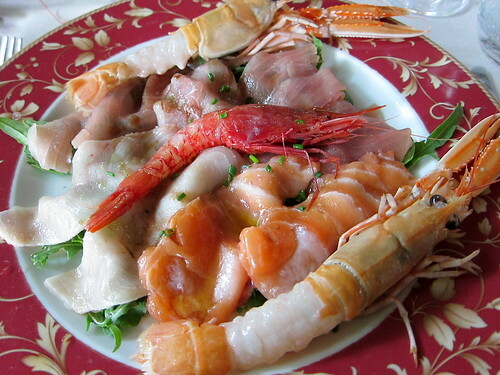 A typically Milanese starter of seafood carpaccio, this is Italy’s answer to sashimi. There was impossibly fresh salmon, tuna and white fish with two types of prawns. 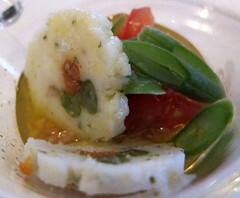 It was all dressed lightly in olive oil and was wonderfully tasty, each bite bursting with the sweetness of the sea. 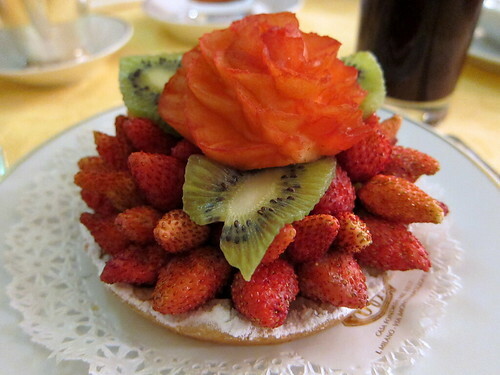 I would definitely go back there just for this dish, far away as it may be from the touristy areas of Milan. 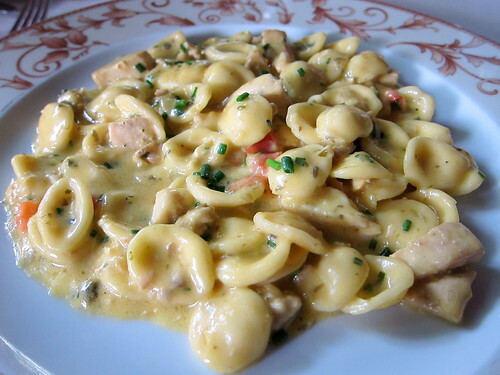 My main was an orecchiette in a tomato cream sauce and a meat I cannot recall, probably chicken. Sadly, it wasn’t mindblowing and it was forgettable in my seafood-dazed, jetlagged stomach. 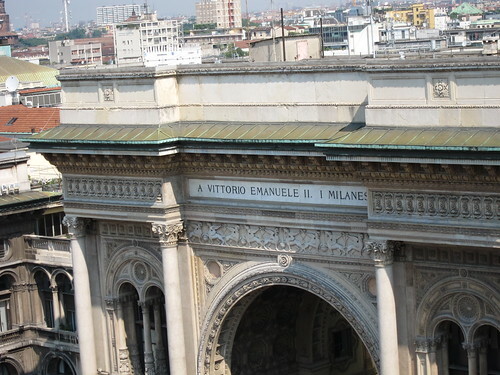 Our last meeting was, curiously, in an old Roman building that housed the Milanese headquarters of a high tech company . We got through that aided with plenty of hot espresso from thermos flasks, drunk by the shot in tiny plastic cups. We thankfully sank into Hotel Spadari al Duomo, probably the most reasonably priced 4-star hotel of that standard in the area. 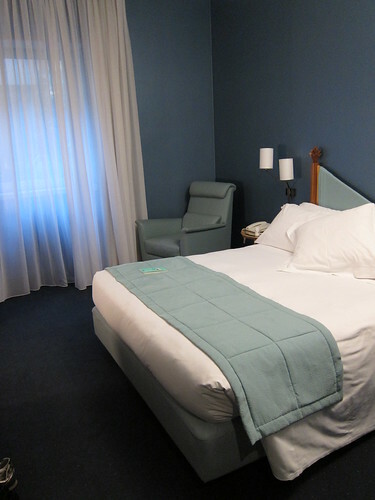 It was a lovely and very modern hotel, with large enough and very comfortable rooms. 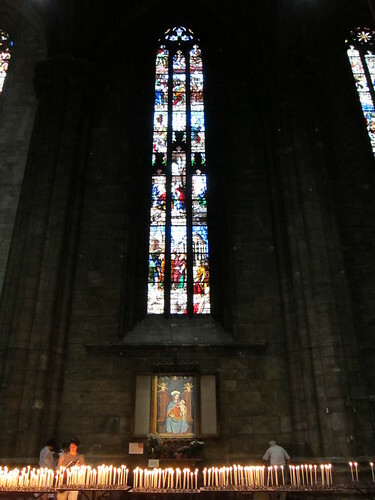 In contrast to the Duomo just around the corner, even the artwork on the walls was modern. I liked how the minibar was included in the price of the room (non-alcoholic drinks only), so I didn’t have to worry about finding a convenience store for water. It was a lovely touch especially coming in on a hot day. But the feature I liked best was the shower. 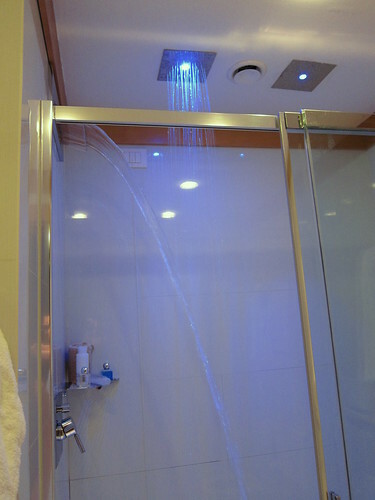 There were three showerheads in there: a regular handheld shower head (not shown), a rain shower and a waterfall shower! It was fantastic standing under a wall of warm water after a long, long day simply enjoying the pressure of water against skin. 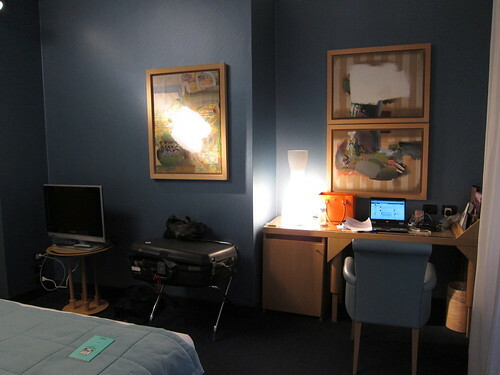 It was a great hotel with very prompt and excellent service, from emailing for reservations to getting our excellent breakfast every morning to making reservations to depart for the airport. Well worth it! But no rest for the greedy. Before long, we had to regroup for dinner. We went for an early dinner nearby so that we could head back to crash out. An institution and therefore tourist hangout in the area was Trattoria Milanese, a pretty down home type place with unfortunately less down home prices. Still, it was considered reasonable for the area. We started off with a mix of appetisers. 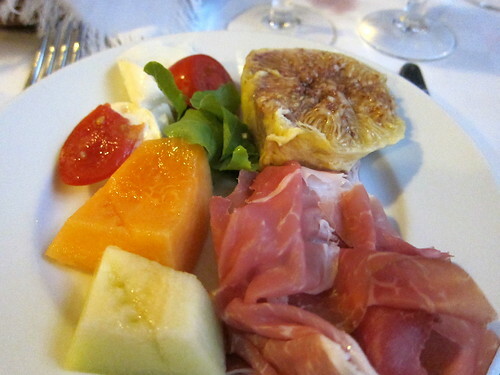 On my plate are parma with melon; tomato with mozzarella and basil; and half a perfectly ripe, luscious summer fig. While not super fantastically good, I think the ingredients travelled far less than it would have if we had the meal back home in Singapore, making it fresher and tastier somehow. 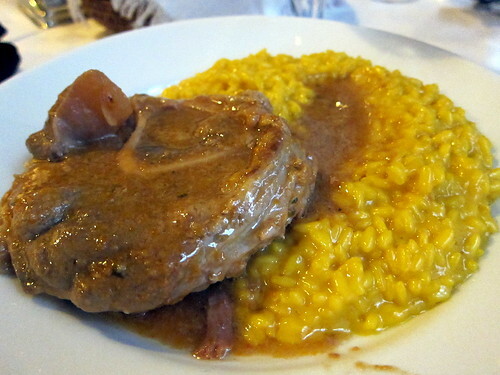 I made the classic glutton’s mistake of ordering osso bucco with risotto. Mind you, it was yummy and very well made, especially the osso bucco with its unctuous marrow just begging to be sucked dry. The risotto was no slacker either, al dente and richly aromatic. I managed to finish about a third of the plate and tried to parcel as much away to my dining companions as possible. It was such a pity that I couldn’t take away any for later. 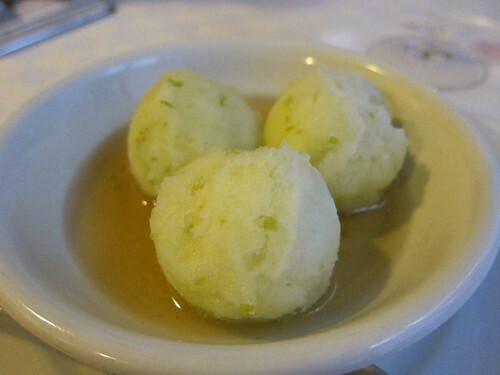 Full to bursting as I was, my greed yet again overreached and I found myself not simply ordering apple sorbet for dessert, but also nodding amicably when the waiter asked if I wanted it doused in Calvados. Unfortunately, the sorbet wasn’t at all tart and was a bit flat on taste, and the apple liqueur was more bitter than aromatic. Still, it sozzled me nicely and at the end of the meal I had to walk carefully so that I wouldn’t stumble on the cobblestones and fall flat on my face in front of the highest ranking person in my organisation. Thankfully, I made it back to the hotel in one jetlagged, sleep-deprived, espresso-ed out, stuffed-to-the-gills and pretty much sozzled piece. Another lovely waterfall shower later, and I was fast asleep, dreaming of my weekend to follow.